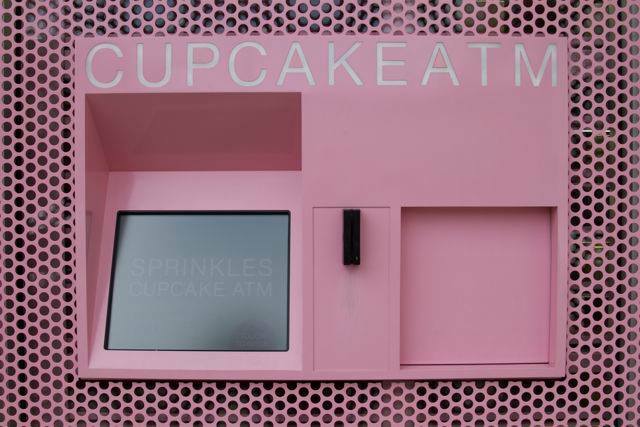 Sprinkles Cupcakes launched their cupcake ATM machine in New York City just last week. This 24-hour Cupcake ATM is located right outside their shop, at 780 Lexington Avenue between 60th and 61st Streets. Sprinkles have been placing ATM’s across the country with locations in Beverly Hills, Chicago, Atlanta, Las Vegas, and Dallas. With the ATMs, their decadent cupcakes available anytime of the day even when their shop is closed. With a swipe of a credit card, cupcakes are dispensed in boxes at the ATM window. Came across an article on Yahoo Food with fun facts about Sprinkle’s Beverly Hill ATM, which has been in operation for about 2 years now. Busiest time of day: Between 10 p.m. and 2 a.m.